The Republic of Haiti is found on the island of Hispaniola, which it shares with the Dominican Republic. It covers 27,750 km2 of the island and is the home of almost eleven million people. 95% of these are Black Haitian, 87% Christians. Columbus got here in 1492, and actually ran his ship on ground, forcing him to create the first European settlement in the Americas, naming it La Navidad - after the day he crashed. 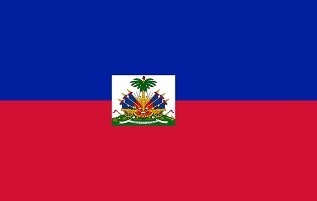 It was pinched by the French in early 17th century, and during Bonaparte's wars, the local revolted and formed the sovereign state of Haiti on 1 January 1804. The climate is tropical, but due to the mountains (up to 2.680 metres), here are colder areas as well. There are nine life zones, from low desert to high cloud forests, as well as four mountain ranges, and hundreds of rivers and streams and the coral reefs in the seas that surround the islands. That is the perfect setting for a vide range of plant and animal species. Beside from the rich marine life, here are around 5.600 plant species of which 36% are considered as endemic to the island. The nation has 300 orchids and 600 fern species. 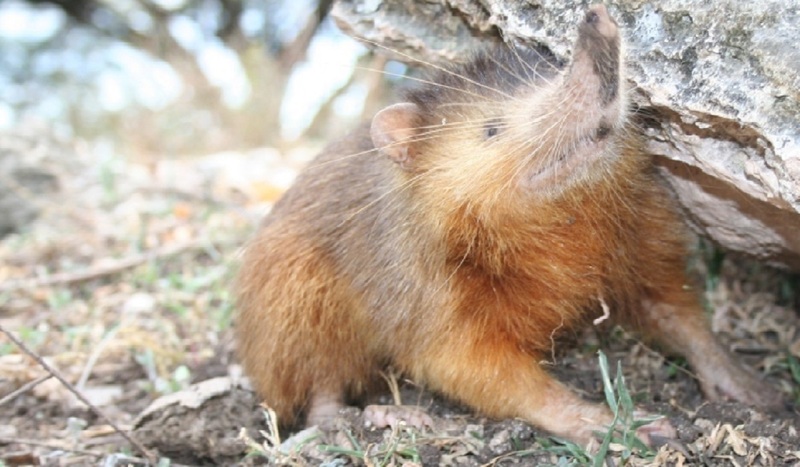 Among the many mammals that once was found here, the Hispaniolan solenodon; Solenodon paradoxus, kind of a giant mouse is one of the few surviving - and only barely. The birds are doing a bit better with around 300 species. 15/2 2019. I arrival in the airport in Port au Prince from Jamaica as planned, but apparently, Budget is no longer in the country. Their desk is, but their telephone disconnected. A taxi can drive me the eleven kilometres to my hotel for US50, or I can rent another car for a week for US490. Considering it is getting dark, I go for that. But they tell me my MasterCard is not working. I try the ATM, but it will only pay out US$ 60 a day! I agree to let them hold on to my passport, and drive off. Defiantly not my first choice, but the country is apparently dominated by riots. The road from the airport to the hotel is dominated by concrete blocks, piles of trash, burning tires, gatherings of people and general misery. I can't find the hotel, but I manages to get them by phone, and they pick me up. Really nice people, who tells me Haiti have been exploiting in violence the last 14 days. Gas stations - and everything else, is closed, so are all the roads out of the city. Not exactly what I had planned! The lovely people I am staying at, offers me food, and will try to help me getting out of the city and obtain cash. I try to find a flight out of the country in the morning, but fails. I might end up inside her for a week, but I can't figure; how I get cash to buy back my passport. For once in a long time, I can get a hot shower. On the other hand, they don't know when they can get the water-truck to come next time. In-flight and burning truck tires. 16. I really don't sleep well, but I don't come up with any great solutions either. I fail to find any flights out of here, but at least, it sound quiet outside in the morning. The internet is working, and I find the contact information for the Danish Consulate (and Canadian embassy, down the road), and write the consul an e-mail, asking for advises. This morning, the headline in a Danish newspaper is the story about Canada have evacuated all113 tourists in Haiti. Would have been nice to know yesterday. I write to my booked hotels in Jacmel and Cap-Haitien to hear; how the situations are there. At ten, I have still not seen my hosts, and I feel a bit alone. A short but hot shower is a treat, but so would breakfast be. Then my hosts wake up, and tell me the Canadian, US, British, French and other embassies have been evacuated, and I still feel alone. I try to call the Danish Consult, but only auto-reply. I try to write the Danish Foreign Ministry, but the internet have gone. I still feel kind of alone. It seems like it is a quiet Saturday in Port au Prince, and my host offers me a tour around to find cash, and a friend of him joins in. Some of the ATMs have 30 people waiting, but further out of town, less people await their turn. Then it turns out, I only can withdraw 5.000 Gourdes a day AND 10.000 Gourdes a month. Around US$ 60 a day and $120 a month. Less than I need to buy back my passport and pay for the room and food for sure! The situation is a bit stressed by now. The gas stations are closed - real closed with huge metal closets around the stands. Roomers have it; they might open later. In some squares, a lot of paintings are displayed, but it can't be for the tourists, as I'm the only one in the country by now. We have driven out to the mountains in the outskirts of town in the search of cash, and my host offers me a scenic tour, while we are out here. It seems to be a quiet day, and a great idea. Here are still the traces of road blocks, but else, it is a normal Saturday - all though real quiet, especially down-town. The higher we drive, the bigger and more walled in the houses are. The president's and former president's houses no exception. We pass a few villages, where the market take up most of the central part of town. The nature seems quite green, and a few goats are shepparded around the side of the road. We reach a peak with a great view over Port au Prince, way down in the mist. Here are several stands with rather eager souvenir sellers - poor guys! We head back, and head up another mountain. More lively villages with lot of farm products, well dressed people and lots of mopeds. We reach the pine forests on the peak and Fort Jacques; a French fortress. It is closed due to the earth shake last year, but we make a walk around it. Here are a few Begonias and strangely enough some Garden Nasturtium; Tropaeolum majus, which must be brought here by the French. Several eager guides offers the tour around - man, they must be desperate! As we head down again, me meet a line of cars - or actually three lines in the narrow road. It seems like a gas station have opened, and the interest is immense. Lots of cars and even more mopeds with several guys on, all holding 20l yellow containers - or whatever you can fill gas in. I have not been drinking anything the entire day, and find some sodas for us. Unfortunately, it is too late, and I get a heat-stroke. Finally, we make it back to town, and I offer a lunch at any place, accepting credit card. I feel even worse while we wait for the food, and end up getting it in doggy-bags. At home, I head straight to bed, feeling cold and warm, dizzy, sig and miserable in general. Around ten, I feel better, and start to sleep. Port au Prince, mountain villages, Fort Jacque. 17. I feel much better, and real hungry. Again, my hosts sleep to real late, but I have some quite dead Cesar salad from yesterday. I do last nights work, and when my host appears, I get him to call the car rental office. They agree to take back the car, and only charge me for three days. Going down the the centre to see the things there, is out of the question, as the government offices are here, and the epic centre for the demonstrations. I don't dear going out of town either, as the roads can be blocked at any given time. Now, I can at least walk the eleven kilometres to the airport. We do some driving around the most of the outer Port au Prince to find gas, but they only have diesel. There are massive lines for that and cooking gas. Besides from that, it seems like a nice Sunday, but they use to be: You can't demonstrate while you are in church. The car is running on fumes by now, and we return for my host's car. In the airport, some real heavy armed white soldiers are present, and it is strange atmosphere. They car-guys are a bit disappointed, I haven't gassed the car, but I mainly spend the gas looking for an ATM to pay them, despite they said they took credit card. I end up paying US$297, and to my relief; on my Visa card. I hope to get the US$355 back from the Budget car, I didn't get. Anyway; It have been some expensive 100 kilometres! On the way back, we actually find a gas station with gas, and a surprisingly short line. I pay for a full tank on my host's car, hoping for a lift or two in the coming days. We see the remains of a lot of road blockings around the town, and it seems like every old tire in the country have been burned by now. They might call off the demonstrations till they get new ones imported? Some of the streets we drive, are still partly blocked with concrete, but the tires have burned out. Some of the steeper hills were not blocked in a traditional way; they were oiled! Besides from the gas, I also offer to go shopping in the supermarket; whatever they want, as long as I can pay by card. It is the least I can do, considering they will have to feed me for a week. I just hope it is only for a week, and my flight actually will departure as planned. It is said the roads to the Dominican Republic border still are closed. Shopping food here is even more expensive than in Denmark! Around twice the prices, as most are imported, even the letish, which are Californian. But the big supermarket is quite full, and pretty much what I find at home. I get a nice dish, when we get home, and then my hosts leave for the evening. I wished I had internet or another way of entertaining myself. All I can come up with is reading (much needed) corrections on my diaries. Still Port au Prince. 18. At least, I have my own breakfast now, but entertaining is a bit hard. I can't even get the internet to work. Within long, I am ready to explore the neighbourhood. It seems like a quiet day, but the area is fare from interesting. It is only domestically houses with tall walls around. My host is told not to come to work anyway, and I join him at the search for cooking gas. That bring us quite some around in Port au Prince, and I absorbed the views - and try to get some photos. Here are quite some trash lying around, but it is being removed from one end - funny enough by men in yellow shirts.. Thinking about it: The most striking thing about Port au Prince is the waste amount of colourful Bougainvillea. Actually, the town is rather green, seen from the surounding mountains. We finally get gas, and while they wait in line, I do a tour around the area. On the way home, we pass an official office to get a new driving license for my host. Right next to the office is a small square; Place Saint-Pierre, with some artists selling paintings, some selling ironwork and some woodcuttings. I find a small HAITI cut in wood, and figure it will be more appropriate than a piece of concrete with traces of burned tires. I find an ATM, willing to pay out 20.000 Gourdes, and now I can pay my host for the stay in local money, and save my US$. Then I find us some sodas, and as a bonus, I get two cool, seven sided brass coins back. We sit and chat at the Place Saint-Pierre for some time, and then head home. I get a call from the closest Danish ambassador - in Mexico, and assure him, I feel fine and safe. I have sorted out my passport and financial problems, and the word on the street is: The president have given quite some concessions and promises. At three, I am so ready for adventure, but it seems like another afternoon in a gloomy room - and without internet! The maid have been here all day, and I get to pay her 500 Gourdes. She come twice a week, and do all the cleaning, the washing and the dishes. I could consider getting that at home. And now, she can buy - next to nothing at the supermarket: A small can of tuna in water and a little can of beans. At five, I'm really restless, and head out for a walk in the neighbourhood. My plan was a stroll around the block, but after seeing the side alleys, I remain on the main road. I reach the bus station - where the small pick-ups are lined up along the road. A dry river runs under the road, and it is filled with trash. Hardly any organic, considering the amount of goats, pigs and dogs which are found here. Next to it is a barber shop, and I could do with a cooling army-cut - but I would have like to keep half my moustache. Accordantly to his wall, it should be 20 Gourdes, but I end up paying 130. Then again, US$ for a half hour haircut, which made him run the generator for the entire time, don't seem to expensive to me. I doubt he get to buy food where I do! He won't have to a small can of tuna - or anything else we bought. It is getting rather dark before I find my home, but I find the atmosphere in the town quite friendly. In the evening, I show my hosts some pictures from around the world. More Port au Prince And even more. Time to start on Diary 2 - and still Port au Prince, I'm afraid.